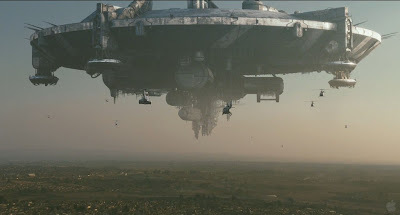 District 9 is a relatively low budget sci fi thriller set in South Africa that's had generally positive reviews by the critics--especially compared with Hollywood's usual crop of conceptually stale by-the-numbers summer action thrillers. However, my wife found the violence and language too off-putting for her. I didn't mind that, but after seeing it in a theatre and going home and reading a bunch of reviews on the Rottentomatoes website, I was surprised to find that not one of them mentioned that this film was designed to be watched on a big screen TV at home. To wit: it uses 16:9 big screen TV formatting rather than the normal movie theater widescreen ratio. And it's filled with tight close-ups and medium-range shots, which again optimizes it for TV viewing. Something like "Master and Commander" was great in a theatre, with beautiful, crisp, cinematography and shots that really exploited the movie theatre scale and format. I'm not complaining about the director's choosing to optimize this film for DVD. Many films are, and that's fine. It's a good format, and I've enjoyed watching many films on our 46" Samsung LCD TV. I am complaining about all those movie critics missing this fact, which was glaringly obvious in the first 5 minutes. If I'd known this I would have waited for the DVD. BTW some critics didn't like the performance of Wikus, the central character. I thought he was fine, though, and so did my wife, and both of us are film buffs who love Kurosawa and other high art directors. He plays a doofus who's hamming it up for the documentary crew. But the actor isn't hamming. It's the character who is. Some of these critics really should be working in a shoe store or something. As sci fi films go, this isn't as fully realized as, say, "Serenity." OTOH the script is vastly better than anything George Lucas ever "wrote." Really this is in the old Hollywood B movie tradition, with both that tradition's faults and virtues. It's gritty, downbeat, morally complex (think Todd Browning's "Freaks"), with an efficient plot and some very effective, somewhat grainy (purposely so) visuals. The image of the giant floating spacecraft is iconic. So I'd say see it on your wide screen at home when it's released on DVD, or if you do go to a theater, sit farther back than you would normally; warn those with queasy eyes and ears to leave the room; and don't expect one of those everything-neatly-tied-with-a-bow endings.